You didn't give up sweets for Lent, did you? If you did, may I suggest putting this on your list to make AS SOON AS Lent is over?!? Did you know that Oreo is turning 100 years old? Did you know that to celebrate, Oreo is making Birthday Cake OREOS?!? Really. The filling looks like a funfetti cake and they taste like, well, Oreo mixed with cake. How can that be bad I ask you? So, of course, we can't just EAT the Birthday Cake Oreos, we must BAKE with them. If you can't find Birthday Cake Oreos (I found them at Target), feel free to use regular Oreos. I bet these will still be some of the best brownies you've ever eaten. And, oh...don't feel obligated to top yours with Haagen-Dazs 5-Ingredient Vanilla Bean ice cream. But if you do, you won't be sorry. And hey...you still have months until bathing suit season. Preheat oven to 325. Grease a 9x13" baking pan. 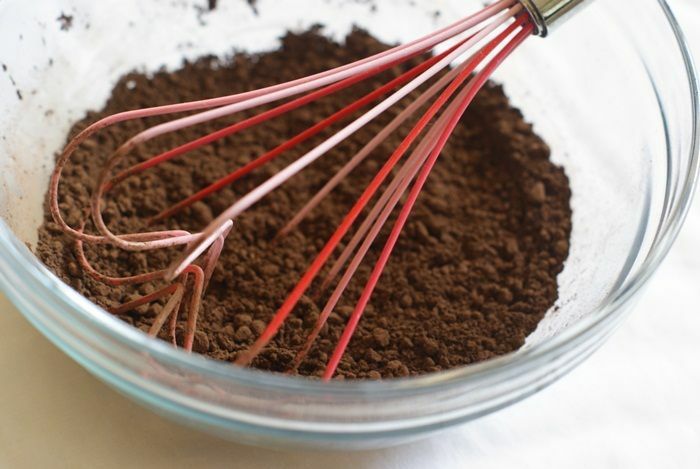 In a medium bowl, whisk together the cocoa powder, salt, and baking powder. Set aside. In a medium saucepan, heat the butter over medium-low, until melted. Add the sugar and stir to combine. Continue heating about 1-2 minutes, until hot. Remove the pan from the heat and add the cocoa mixture, stirring until combined. Add the eggs and vanilla; stir until totally combined. Add the flour and stir again until smooth. Spread half of the batter into the prepared pan. Top with 20 Oreos. 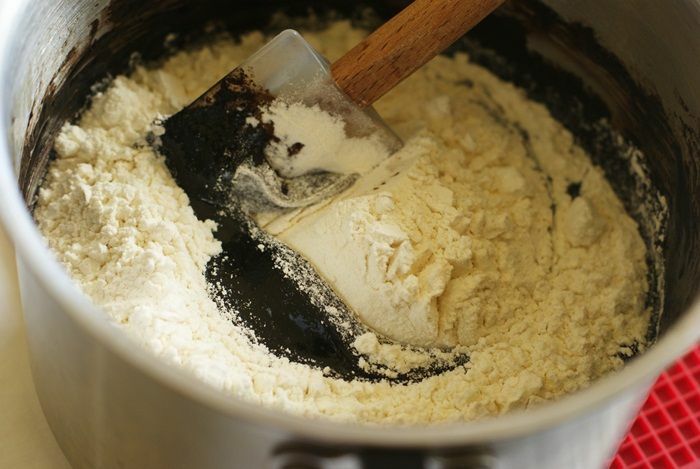 Cover with the remaining batter; spread gently with an offset spatula. Bake for about 30 minutes, until the brownies are done, but the center still looks soft. Set the pan on a wire cooling rack and let cool 10 minutes. Meanwhile, stir together the corn syrup and water. They look amazing!! I just made something with those Oreos last night, so good! They look so dense,rich, and everything's better with 20 Oreos stuffed into it...I need to get those Oreos, stat. Oh my word! 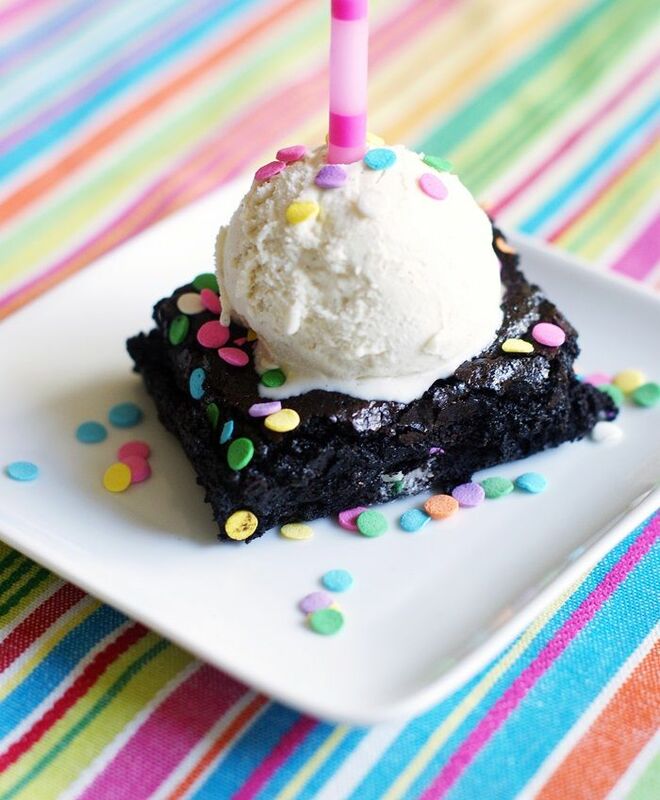 I had no idea there were birthday cake Oreos - and brownies make EVERYTHING better! LOVE this!! oh yum, that looks and sounds so good! Kids will love this! Really lovely! Not only do these look and sound delicious but I sooooo love that red heart shaped whisk I see in the picture. I want one, I want one, I want one! You sure know how to celebrate a birthday! Those brownies look like the gooiest brownies ever. And therefore, the most perfect. I keep scrolling up... they're so gooey! I can't get over it. You're in trouble! I bought them when I saw your instagram pic, we ate the whole bag in one day. Yikes! Now I have to go back to make these brownies. This looks absolutely adorable and delicious!! Thanks for sharing!! I can't wait to try it! I love all your adorable ideas you share! These look so good! These look delicious! I have a Birthday Cake Oreo post scheduled for tomorrow. :) (However yours is MUCH better put together than I could ever hope for!) Aren't these the best Oreos??? OMG! I need these Oreos! I had no idea they existed...if I can track them down in Canada, I'm making this recipe! I've resisted buying them because they're not double stuffed - totally wrong of me right? I would LOVE a bit of that brownie goodness. The corn syrup/water is just going to help those sprinkles stick. You brush it on really lightly...you won't even notice it. I sort of adore these. Fantastic recipe! yummm!!! I just gained 5 virtual pounds eating up this post and I don't care ...lol! When I saw these Oreos the other day in the grocery, I didn't think it could get any better. Boy was I wrong! And I AM one of those people who gave up sweets for Lent. These are really making me rethink my decision! I picked these up on monday. sooo good!! can't wait to try these brownies!! 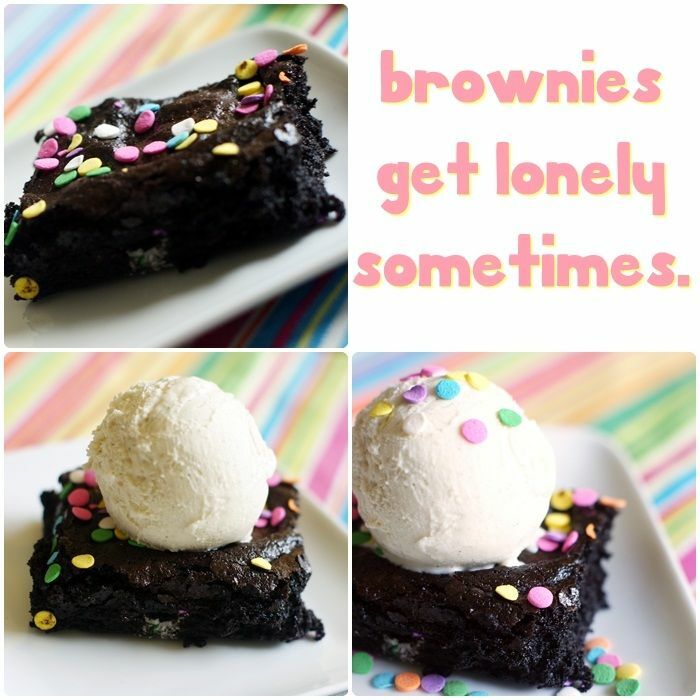 I certainly do not want a lonely brownie! I need to help them out. I just took two packages of these Oreos out of my shopping bags about 2 minutes ago. I guess it was meant to be. Oreos mixed with cake batter is like the most brilliant invention since, well...since the oreo. Stuff that inside a brownie and you deserve a nobel prize. Good work! I'm trying not to pass~out! I mean is this like for real! Happiest dessert on the face of this earth! Who blew the candle out? And I love those haPPy sprinkles! i can't wait to try the oreos! nice recipe for them! This post is so happy!!! I had not a clue these adorable oreos existed. Happy Birthday Oreo indeed. 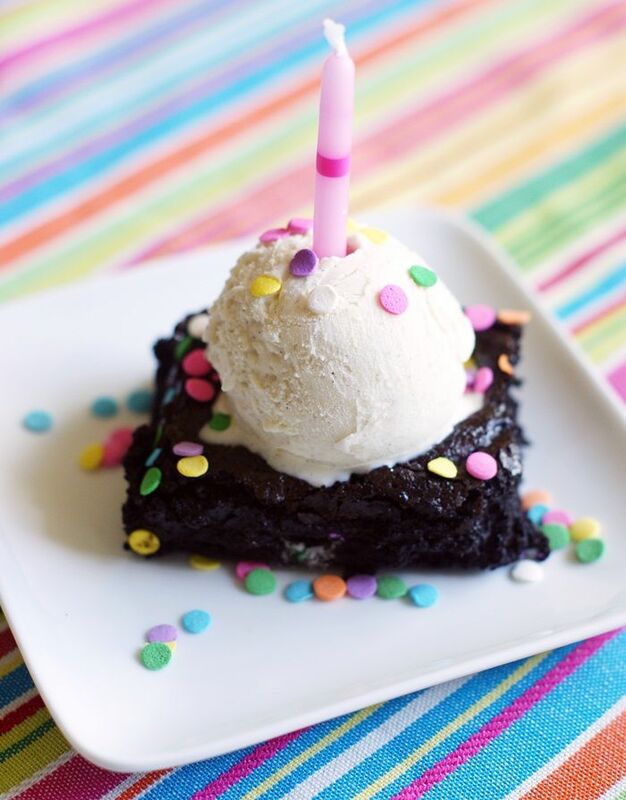 These brownies are the perfect way to celebrate a classic! Birthday cake oreos???? I MUST FIND THESE!!! And then make these brownies because they look insane. There are so many people who liked these brownies and that it includes me, I can't react but it’s just perfect. 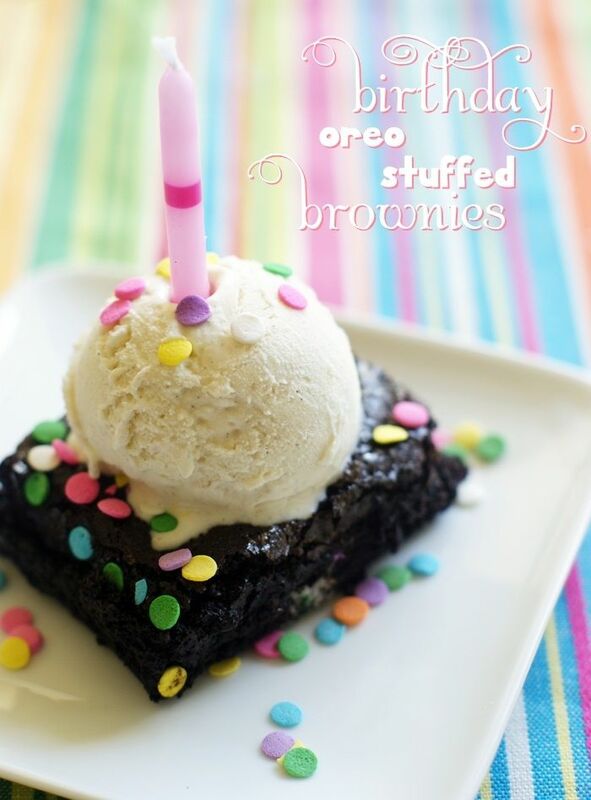 Those brownies look like fudgy perfection, what a way to celebrate Oreo's birthday! Ughhh I've been ignoring the birthday cake oreos at the store for weeks... no can do anymore! What beautiful pictures. Sigh we never get all the good flavours here in Canada, I doubt we'll see these Oreos. My friend just brought back Pumpkin Pie pop tarts from the States, they were heaven! But even regular Oreos would be delicious, thanks for the idea! I got up midway reading your post and added Birthday Cake Oreos to my grocery list, for TODAY! Your brownies look fun, festive and delicious! I am sure it is no coincidence that there are exactly 21 oreos in the package, and exactly 20 will fit in the pan. you are simply genius... and I will bow down and praise you as soon as my brownies come out of the oven. in exactly 23 minutes. My daughter and I LOVE Oreos. My next visit to Target will include these Birthday Oreos and I'll just have to make these brownies too. Thanks for sharing this. I had no idea that there were Birthday Oreos. YAY! i WILL be making a batch of these this weekend!! but, you live in Texas!! why the haagen dazs?? you need BLUE BELL on top!!!! My thoughts, exactly! The Blue Bell plant is about 45 min from my house... Mmm Homemade Vanilla! We just bought a package of these yummy birthday cookies last week..mmmm. These brownies look so pretty! Love the,! So pretty and fun!just like you! OMG! These brownies look amazing!!! Just saw these by the checkout aisle at Target. Now I have an excuse to go back. I see more Oreo celebrations in my future! 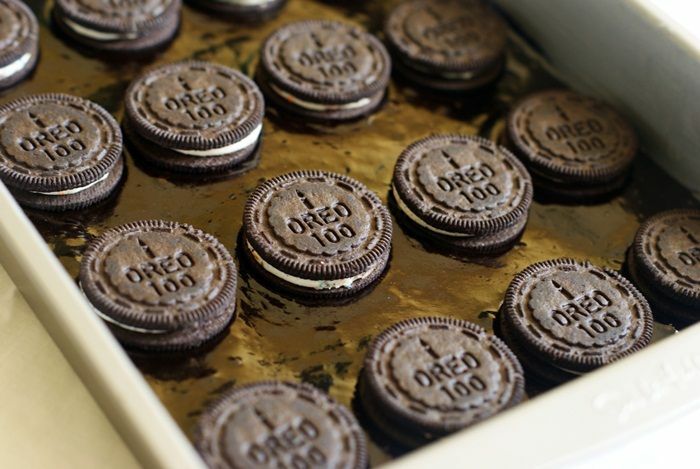 Very coool it's Oreos 100th Birthday! I've got to try their Birthday Cake Oreos. 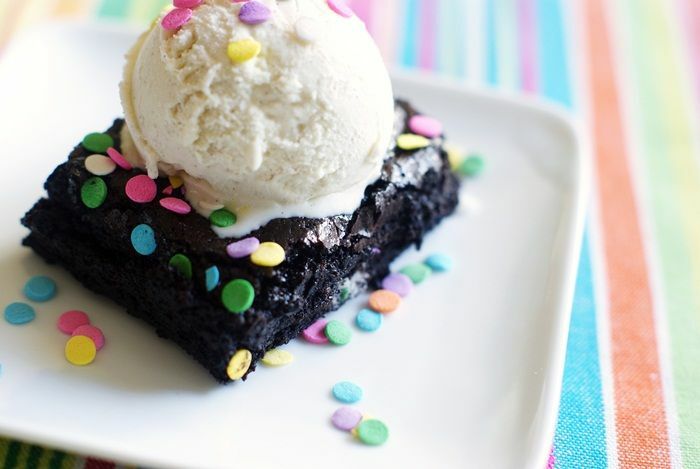 And when I do, I will definitely make these insane brownies! I made these this morning and they're so good! Thanks for the great recipe! Wow! These look fantastic, can't wait to try them out! Oh wow! Those look delicious. Here's a tip for you, Bridgett. For some reason, a plastic knife is the best thing in the world for cutting brownies. You can even cut them while they are warm without making a giant mess. Try it and you'll see what I mean! Sorry this may be silly. I was looking for the dark chocolate hersheys at the store and only saw the regular hersheys. Can you use either one?? I was super nervous about using regular cocoa, but when I couldn't find any dutch-process, I just went for it. The brownies were phenomenal even without the dutch-process cocoa, so I can say from experience that it is totally fine to use with this recipe! 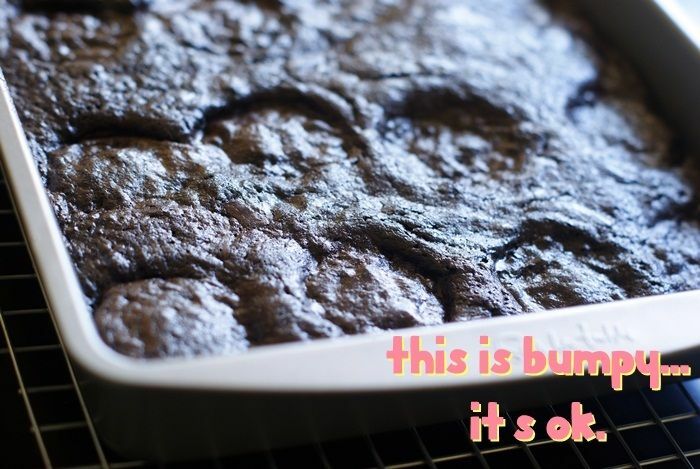 Seriously killer brownies - thank you for the post!! Okay. 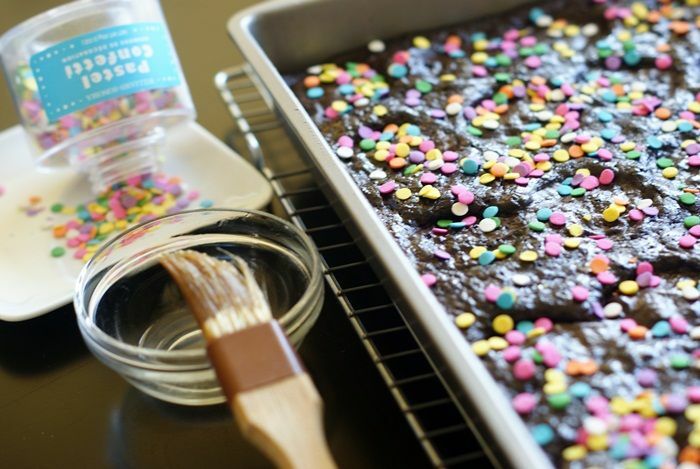 These brownies look super amazing and I want some...right now. I did make your recipe, though, and my brownies came out tough and over-cooked! Your batter looks so smooth. Mine did not. When I melted the butter and added the sugar, the batter was thick and grainy like. What did I do wrong?! I need these in my life. I did use a darker pan, so I may have made that mistake by not reducing the time or something. Hmm....well, you definitely don't want to over bake these. The brownies should be fudgy. A very dark pan does conduct more heat...I recommend using a light colored pan...and maybe check your oven temp? 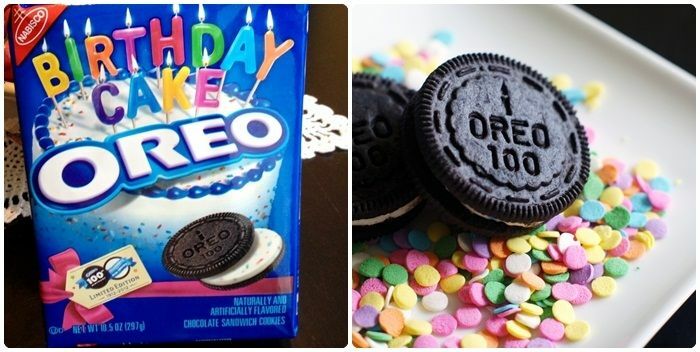 oh how fun, these look amazing, i can't wait to try the birthday cake oreos! oooo i love the sprinkles. These are super adorable and they look completely amazing and delicious! OKay - I made these tonight and OH MY WORD they are good. I had bought the cookies a few weeks ago and they were yummy. Then ran across your recipe so I bought more this past weekend. SO YUMMY! I have found one of excellent tutorial to make this birthday cake. It's truly looking one of superb featured source to see this delicious item. I am totally surprised to see the authentic way to make the same one. Thanks of sharing. Birthday cake oreos?? I must look for these! Excellent tutorial to make a birthday cake... I like it. what a recipe! Simply stunning. These looks so nice and delicious. Great job. Thanks for this amazing post. hello, i want to bake so many goodies from your recpies but i have a very basic question that while baking cakes , breads ,on which rack of the oven should the pan be kept and should the both elements of the oven be on or only bottom element be on? i have OTG and i am from India. i hope for the earlliest reply so that i can go ahead with the baking. If I had the oreos right now, I would make these in a heart beat!!! I can't resist and wants this delicious things. gift to Pakistan is one of most reliable shop to send gifts…you can send gifts to Pakistan now at cheaper rate. Please add a 'Pin' button!! I would love to Pin these to my Dessert board on Pinterest :) BTW do you take all these pics yourself? Great pictures! Great recipe. Love love love. Oreo + Brownies = OMG. Love. I love oreos and thanks for sharing this recipe. For me, this recipe would be good to pair with this recipe called banana pudding. Your cake looks gorgeous! I It's sweet, addictive, festive and fun, with a subtle taste of birthday cake in every deliciously rich handful. Thank you for excellent post. Is clear why America is so obese.